The Moseley manuscript map is a previously unknown map of Colonial-era North Carolina that appeared for sale at auction in 2007 with unknown origins. Before this, the best-known and earliest map of North Carolina was A New and Correct Map of the Province of North Carolina, created by North Carolina's Surveyor General Edward Moseley and printed in 1733 by John Cowley of London. 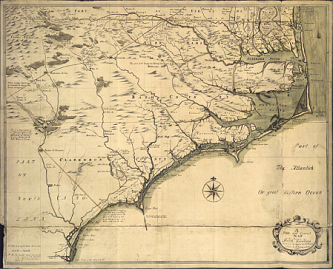 It contained the first detailed and accurate survey of the North Carolina coast. 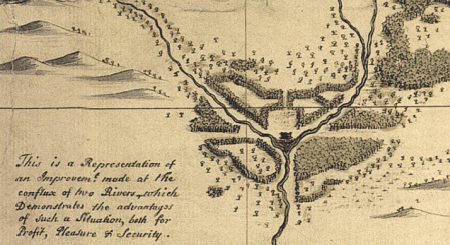 It was not until 1770 that another map of North Carolina with such detail was printed. Although the 1733 map is well known, there are only three known copies still in existence; one is at East Carolina University. Moseley's manuscript map is a hand-drawn original, dating from approximately 1737, and is labeled "…drawn from the Original of Col. Mosely's [sic] Survey by J. Cowley, London." The map is very different from the 1733 version. It is colored, indicates county borders, and has the first depiction of the border between North and South Carolina. One of the most unique features of the map is the inclusion of a fictional settlement where the Yadkin, Uwharrie, and Pee Dee Rivers meet. The caption for this imaginary colony says: "This is a Representation of an Improvement made at the conflux of the two Rivers, which Demonstrates the advantages of such a situation, both for Profit, Pleasure & Security." This is a clue to one of the map's purposes, which was to encourage settlers to come to North Carolina. However, the map's primary purpose was most likely to help wealthy land speculator Henry McCulloh and his partner, future North Carolina governor Arthur Dobbs, obtain a 1.2 million acre land grant in North Carolina in 1737. They would have presented the map to the British Board of Trade to show what land they wanted. In a way, the Moseley manuscript map has been hiding in plain sight. A popular 1752 portrait of governor Dobbs shows him holding a map of North Carolina, which looks very similar to the Moseley manuscript map. The map is privately owned by businessman, collector, and independent scholar Michael McNamara of Williamsburg, Va.
McNamara, Mike. "A New and Correct Map of the Province of North Carolina." Journal of Early Southern Decorative Arts. 33 (2012). http://www.mesdajournal.org/2012/correct-map-province-north-carolina/ (accessed November 15, 2012). McNamara, Mike. "The Moseley Manuscript Map of North Carolina of 1737: Its History and the Hunt for its Provenance" (lecture, University of North Carolina at Chapel Hill, March 10, 2012). Blythe, John. "A New and (Improved?) Correct Map of the Province of North Carolina." North Carolina Miscellany. February 9, 2012). http://www.lib.unc.edu/blogs/ncm/index.php/2012/02/09/a-new-and-improved-correct-map-of-the-province-of-north-carolina/. Moseley, Edward. "New and Correct Map of the Province of North Carolina." Map. 1733. North Carolina Maps Collections, East Carolina University. https://digital.lib.ecu.edu/1028 (accessed February 1, 2015). I am researching the war and trading paths of the 1700's Cherokee. I am interested in a copy of the 1733 Edward Moseley map of North Carolina and also any other maps concerning 1700's Cherokee towns and travel routes. Please email me and let me know if these and other maps may be purchased. I am very excited that I can get a copy of the Mosely map. It will show where the Welsh Tract is located in present Pender County. Home for Evans and Bloodworth 1731. It is available in 32 X 25 inches for $5. The link to the Mosely Map is no longer active. Is there an alternative link? Is this the map you're looking for?